The youngest of the Crystal ships, the Serenity, is a highly glamorous and incredibly modern cruise liner. Catering for the black-tie elegance of a sophisticated and equally stylish clientele, the Serenity invites you into a world of fine dining and lavish décor. The aesthetic of the Crystal Serenity is one of style and sophistication, with classic visual elements modernised to give a unique, contemporary finish. The ship is manned by a loyal and committed crew, with positive, attentive service a major feature of your journey. With a 1,080-passenger capacity, the Serenity is a luxury liner, addressing every penchant of their devoted clientele, to offer a complete cruise experience. 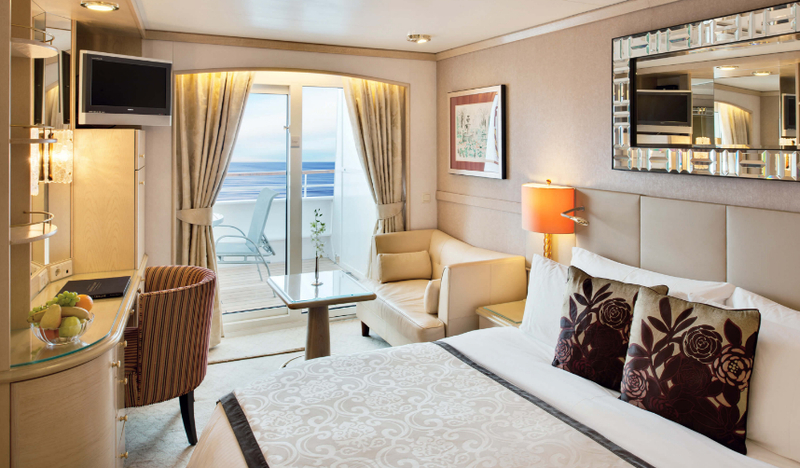 Each cabin aboard the Crystal Serenity has been given a chic, stylish finish that includes wood furnishings and Egyptian cotton linens throughout. There are in-suite satellite televisions and internet access available across the full range of rooms, so you never have to stray too far to be entertained. 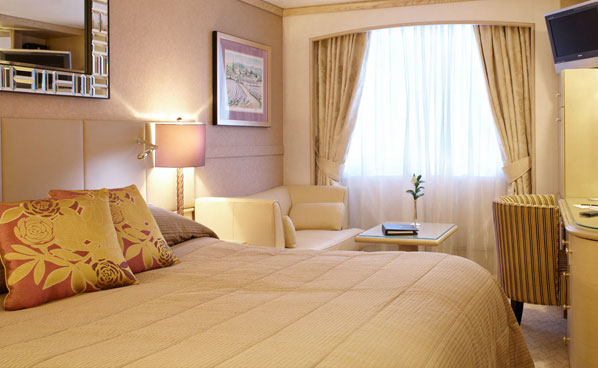 The Crystal Penthouse is butler-serviced, with a Queen-size master bedroom bed. It has a spacious living area, walk-in custom closet and opens out onto a stunning private veranda. The Penthouse Suites are equally well presented, with the addition of a full jacuzzi bathtub. 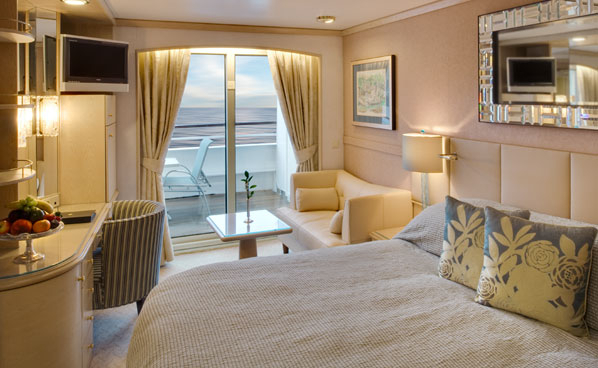 The Deluxe staterooms come either with a large picture window, or outside veranda. They too house sizeable queen beds and also are hypoallergenic, thanks to patented air purification systems. The Crystal Dining Room is the ship’s anchor restaurant, designed and serviced with the utmost care for the ultimate gastronomic dining experience. Simply make a reservation to suit your schedule in advance, and allow the maître d’ to address your arrival with the warmth it deserves. The menu combines classical dishes with experimental cuisine, allowing you both the excitement to experiment and the comfort of home. The Lido Café offers a buffet option of globally inspired dishes; the Trident Grill, also on the Lido, is an open-style kitchen and cocktail bar combo. For families, Tastes offers the perfect blend of delicious food, with a more relaxed, child-friendly atmosphere, delivered in the guise of perfectly crafted tapas-style dishes. Plus, for fresh, exciting sushi delights, try Silk Road, which offers both table and bar service from which to order chunky lobster spring rolls and yellowtail sashimi. The Crystal Serenity excels at live music performances. Whether it is classical numbers during afternoon tea, a classical quartet in the atrium, or post-dinner Broadway sets in the Avenue Saloon, you are guaranteed emotive music from outstanding professionals. Should you feel the need to relax with a good film, the Hollywood theatre aboard shows an eclectic mix of both classic and modern films - so grab your popcorn and enjoy! The Creative Learning Institute, a Crystal staple, dedicates itself to educating passengers, with tutoring of skills and talks on truly interesting subjects throughout the voyage. The Crystal Serenity has two pools; the Seahorse and the Neptune. The former is considered the main pool, thanks to its whirlpools and bandstand. The Neptune, lies beneath a stunning, sliding- glass roof, which can be opened to expose bathing guests to the elements. The Promenade Decks are considered some of the best at sea, offering walkers the full circumference of the ship on which to trek. Beneath the deck (nearest the stern) are golf driving nets and a putting green. For a more robust golfing session, the Golf Clinic is home to a PGA teaching pro, on hand to help improve your swing. The Crystal Spa is a serene, tranquil environment in which to unwind, offering a full range of services that include hot stone massage, facials and hairstyling. All treatments are undertaken before a stunning full floor-to- ceiling window, which enhances the magnificence of the view. The shore side pursuits offered on the Crystal Serenity are some of the more exclusive excursions available. In addition to standard tours across the cities in which you port, with guided insight into the true culture of the location, there are also a number of other exciting, more extravagant options available. Why not tour in a custom Ferrari, for instance, or fly a MIG fighter jet? More active offerings are also starting to be included and the cruise line has added complimentary "Voluntourism" excursions to all sailings. Examples include assisting with meal preparation for abused, ill or abandoned children; aiding injured sea turtles at a sea turtle research centre; and helping to maintain the gardens with the elderly inhabitants of the 660-year- old Domus Christi shelter. Large picture window. Queen-size bed or twin beds. Complimentary soft drinks and bottled water in room. Flat-panel television with DVD/CD player. C & D have sweeping views, E has a view that is limited or extremely limited. Refrigerator. Security safe. Large picture window. Queen-size bed or twin beds. Complimentary soft drinks and bottled water in room. Flat-panel television with DVD/CD player. Categories C & D have sweeping views, Category E has a view that is limited or extremely limited. Refrigerator. Security safe. Spacious living room with wool carpets, walnut floors, cabinetry and Swarovski chandelier. Dining area with panoramic ocean views. Custom entertainment center with Samsung flat-panel television, Blu-ray DVD/CD players and Bose surround sound. Separate study. Custom built-in bar. Aquavision television in bathroom. Large bedroom with queen-size bed or twins, plus his and hers walkin closets and flat-panel television with Blu-ray DVD/CD players. Master bath with Jacuzzi®, ocean view, crystal sconces and heated Calacatta marble floors, separate shower and bidet. Large private verandah with teak furniture. Complimentary wine plus choice of spirits from set menu upon embarkation. Complimentary soft drinks, beer and bottled water in room. Complimentary newspaper of your choice once daily. Complimentary pressing service. Personal butler service. Cordless phone. Wireless Internet access . Guest bathroom. Refrigerator. Security safe. Private verandah. Seating area. Queen-size bed or twin beds. Complimentary soft drinks and bottled water in room. Flat-panel television with DVD/CD player. Full bathtub/shower combination. Refrigerator. Security safe. Sizeable living area. Private verandah. Complimentary wine plus choice of spirits from set menu upon embarkation. Complimentary soft drinks, beer and bottled water in room. Personal butler service. Flat-panel television with DVD/CD player. Queen-size bed or twin beds, and third berth. Full Jacuzzi bathtub. Separate shower. Walk-in closet. Refrigerator. Security safe. Complimentary select fine wines, champagne and premium spirits, as well as authentic, regional, local and seasonal wine and beer where available Complimentary gratuities for all dining, bar, housekeeping and butler staff Complimentary select fine wines, champagne and premium spirits Complimentary Wi-Fi and Internet access. Restrictions apply Complimentary evening of specialty restaurant dining at least once in Silk Road or the Sushi Bar celebrating the cuisine of Nobu Matsuhisa, and at least once in Prego. Complimentary enrichment via the innovative Creative Learning Institute® and Computer University@Sea® with classes in diverse topics such as world affairs, wellness, art, wine appreciation, digital photography and iPad filmmaking. Complimentary fitness and Wellness at Sea® programs with classes in yoga, mat Pilates, Spinning®, and so much more! Spacious living area. Private verandah. Complimentary wine plus choice of spirits from set menu upon embarkation. Complimentary soft drinks, beer and bottled water in room. Personal butler service. Flat-panel television with DVD/CD player. Queen-size bed or twin beds, and third berth. Full Jacuzzi bathtub. Separate shower. Bidet. Walk-in closet. Refrigerator. Security safe.